Why should companies use crowdweaving? First of all, it simply recognizes the fact your passionate customers remain a talented untapped resource for improving your ideation success rate. By allowing customers to help drive the process, companies will make better decisions. These decisions will both save and make more money for the company. This blog is based on the following study: Yoo, C. W., Kim, Y. J., & Sanders, G. L. (2015). The impact of interactivity of electronic word of mouth systems and E-Quality on decision support in the context of the e-marketplace. Information & Management. EWOM is defined as “any positive or negative statement made by potential, actual, or former customers about a product or company, which is made available to a multitude of people and institutions via the Internet (Hennig-Thurau & Walsch, 2003). One of the best examples of EWOM systems and indeed a prototypical EWOM system is the customer review system. Customers can post text-based comments, insert video reviews, and even respond to other customers’ opinions on the product or service in question through EWOM systems. The emergence of these EWOM systems has changed the way that businesses engage the customers as well as other businesses. To investigate the impact of the interactivity of EWOM systems and E-quality of a website on decision support satisfaction, Olivers (1997) cognition-to-action loyalty framework is adopted as an overarching theory. Oliver argues that consumers build loyalty toward a brand cognitively first, then affectively, next conatively, and finally behaviourally. Adopting interactivity theory and E-quality is appropriate to represent the cognitive aspect of loyalty phases. When decision support reflects customer needs and preferences, customers feel satisfaction with this support. Hence, adopting this construct, decision support satisfaction is useful in describing the emotional phase of the loyalty framework. Finally, E-loyalty is employed to illustrate the conative phase of loyalty. 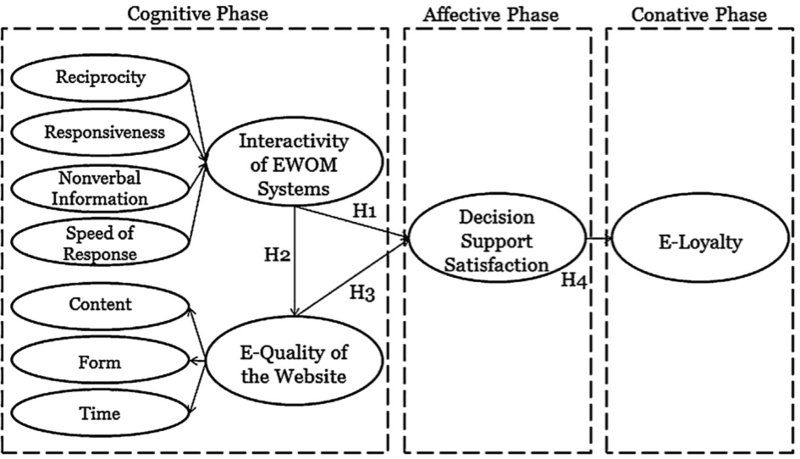 Based on this theoretical framework the authors explore the relationships of interactivity of EWOM systems, E-quality, decision support satisfaction, and E-loyalty by proposing four research questions that can be found in the figure below. 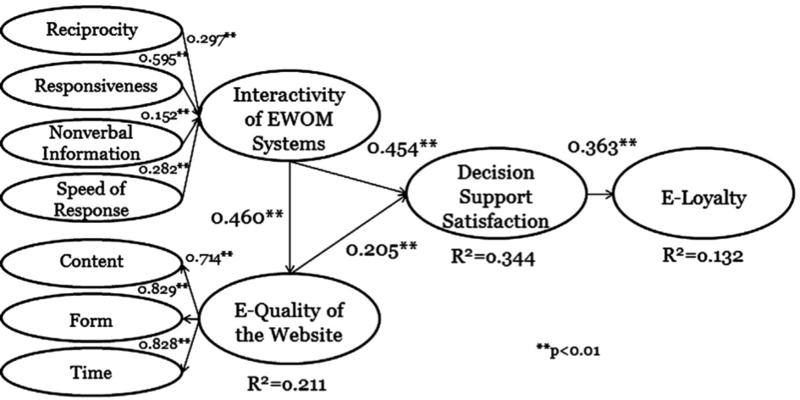 The interactivity of EWOM systems and E-quality are the strong predictors of decision support satisfaction. Therefore, H1 and H3 are supported. The effect of the interactivity of EWOM systems on E-quality is significant, validating H2. Decision support satisfaction is found to influence E-loyalty, thus validating H4. See figure below. These findings indicate that customer perceptions regarding the interactivity of EWOM systems are very influential on their evaluation of an entire website and their level of satisfaction with decision-making support. This study illustrates that EWOM systems and websites with E-quality help customers enhance their decision making process. When the four aspects of EWOM system interactivity (reciprocity, responsiveness, nonverbal information and speed of response) are well managed, users are likely to experience decision support satisfaction with the e-commerce site. This result indicates that e-commerce sites should be encouraged to provide a better EWOM environment for reciprocity and advanced EWOM system functionality, which enables multiple channel communications as well as quick and proper responses to customer requests. The authors believe that EWOM has become an important part of the online shopping experience. Understanding the phenomena is essential for the success of electronic commerce systems. Hennig-Thurau, T., & Walsch, G. (2003). Electronic word-of-mouth: motives for and consequences of reading customer articulations on the internet. Int. J. Electron. Commer. , 8, 51-74. Oliver, R. (1997). Satisfaction: A behavorial Perspective on the consumer. In M. Sharpe, Satisfaction: A behavorial Perspective on the consumer. NY: Armonk. Yoo, C. W., Kim, Y. J., & Sanders, G. L. (2015). The impact of interactivity of electronic word of mouth systems and E-Quality on decision support in the context of the e-marketplace. Information & Management. Co-creation at the apparel company Modcloth can be the future for all apparel companies. They incorporated “Be the Buyer”. Customers can be a virtual member of their Fashion Buying Team by telling them which designs they love. Modcloth will show several designs and the customers can vote for their favourite design. When a style gets enough votes, the design will be sewn and sold by Modcloth. If the item is produced the customer will get an e-mail telling this, so they can be first to buy it and wear it. For a small company like Modcloth, this approach can be the key for success. They can be absolutely sure that the design the customers choose will do well in the market. This way they do not have to make big inventory commitments without knowing if the customers will love the design and buy that piece of clothes. They recently introduced Sneak Peek. With Sneak Peak they involve customers by asking them to let the company know what you want to wear next season out of clothes that are going to by sold by Modcloth. Modcloth can decide how much to produce and how much they will need to have in stock. So this also reduces inventory costs, and the products are better fitted for the customer needs. It is safe to say that they can better forecast supply and demand for specific items than other regular companies. But they are taking co-creation to an even higher level with its “Make the Cut”. With this program users can sent in their sketches, and people will vote via Be the Buyer. The best sketch will be produced and sold. The winner will receive the winning piece, along with $500. So will this be the future of the fashion industry? I think, for smaller, online, fashion stores it is. They can be sure that their clothes are appreciated by a large customer group, and already have potential buyers. The latter, in combination with the fact that inventory costs will be reduced as much as possible is the key to success in this business. The value of co-creation at this company is enormous and this will only grow. So I suggest other online apparel companies will look further into co-creation and use this business model as well. The most beautiful part is that your customers will select the clothes they like the most and that it will most likely reduces cost and gains revenue. A small note here is that this co-creation system of Modcloth is not the large part of the company, the company itself does most of the buying process. However, it is important for any company to engage customers and I think co-creation and decision making by customers is the best way to do this.